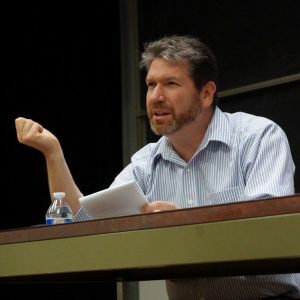 Michael Berry’s areas of research include modern and contemporary Chinese literature, Chinese cinema, popular culture in modern China, and literary translation. Berry’s approach is transnational and his work addresses the richness and diversity of Chinese art and culture as it has manifested itself in mainland China, Taiwan, Hong Kong, and other Sinophone communities. Michael Berry is the author of A History of Pain: Trauma in Modern Chinese Literature and Film,which explores literary and cinematic representations of atrocity in twentieth century China; Speaking in Images: Interviews with Contemporary Chinese Filmmakers, a collection of dialogues with contemporary Chinese filmmakers including Hou Hsiao-hsien, Zhang Yimou, Stanley Kwan, and Jia Zhangke; and the monograph, Jia Zhang-ke’s Hometown Trilogy, which offers extended analysis of the films Xiao Wu, Platform, and Unknown Pleasures. His most recent book is a full-length interview with the award-winning film director Hou Hsiao-hsien entitled Boiling the Sea: Hou Hsiao-hsien’s Memories of Shadows and Light (in Chinese) (Taipei, INK, 2014). Berry is currently completing a monograph that explores the United States as it has been imagined through Chinese film, literature, and popular culture, 1949-present. He is also the co-editor of Divided Lenses: Screen Memories of War in East Asia and Modernism Revisited: Pai Hsien-yung and the Taiwan Literary Modernism Movement. Also an active literary translator, Berry has translated several important contemporary Chinese novels by Yu Hua, Ye Zhaoyan, and Chang Ta-chun. His co-translation with Susan Chan Egan of Wang Anyi’s Song of Everlasting Sorrow was awarded Honorable Mention for the 2009 MLA Lois Roth Award for an outstanding translation of a literary work. In 2016, his translation of To Live was selected for the NEA’s “The Big Read” program. Current literary translation projects include the modern martial arts novel The Last Swallow of Autumn (Xia yin) and Wu He’s (Dancing Crane) award winning novel Remains of Life (Yu sheng), a fascinating literary exploration of the 1930 Musha Incident, which was honored with a 2008 NEA Translation Grant. In addition to his academic writing, Berry extends the scope of his work through various media consultant positions, popular writings and jury service. He has frequently been featured in various mainstream media outlets in the US and China, including NPR, the New York Times, the China Daily, and The People’s Daily. He is a contributor to the ChinaFile and his popular essays in Chinese have been published in the weekly Friday supplement of The Beijing News. He has served as a jury member for the Golden Horse Film Festival, Fresh Wave Film Festival, Los Angeles International Culture Film Festival and the Dream of the Red Chamber Literary Award. His work has received generous support from a variety of organizations, including the Chiang Ching-kuo Foundation, The Weatherhead Foundation, the China Times Cultural Foundation, and the National Endowment of the Arts.